It’s Halloween week and I thought this week I would share some homemade costumes from years past. 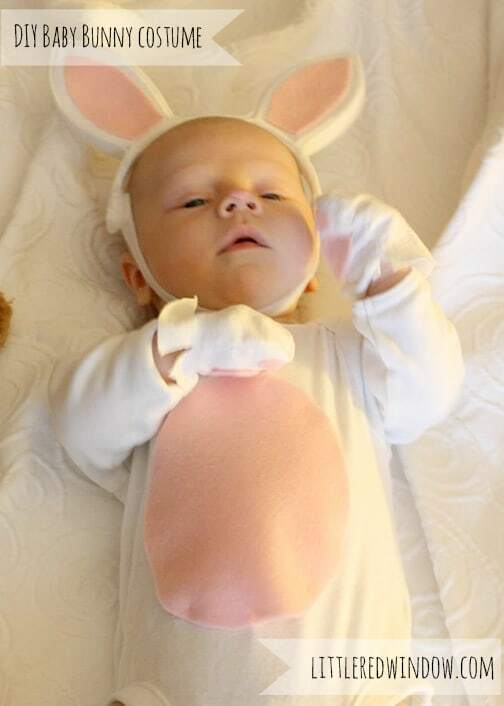 One of my favorite is definitely O’s very first Halloween when I made him a tiny and adorable Newborn Baby Bunny Costume! He was about 2 months old and I remember that making this costume was literally the first even remotely artistic thing I had done since he was born. I was exhausted (as parents of newborns are known to be) and I still wasn’t feeling ready to leave the house a lot. 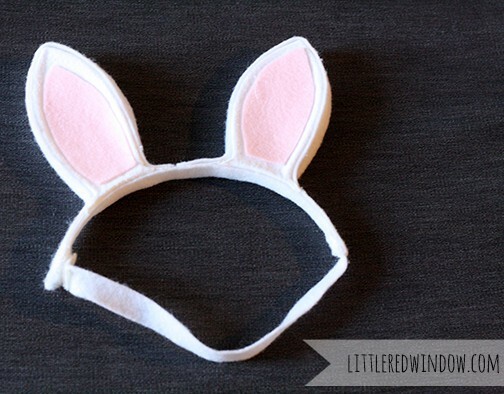 I thought about it way too much and decided I was going to make a Baby Bunny Costume out of only things I already had in the house! I remember making this in my bedroom on the floor while O was napping next to me, trying desperately to finish before he woke up. It was a truly Make it Work kind of project. Tim Gunn would have been proud! The hands and body were easy. 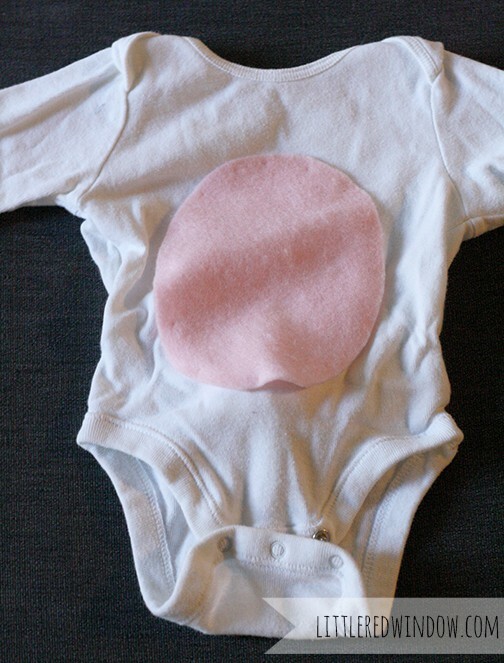 For the onesie, I cut an oval out of pink felt and stitched it to the front to be a cute little belly. 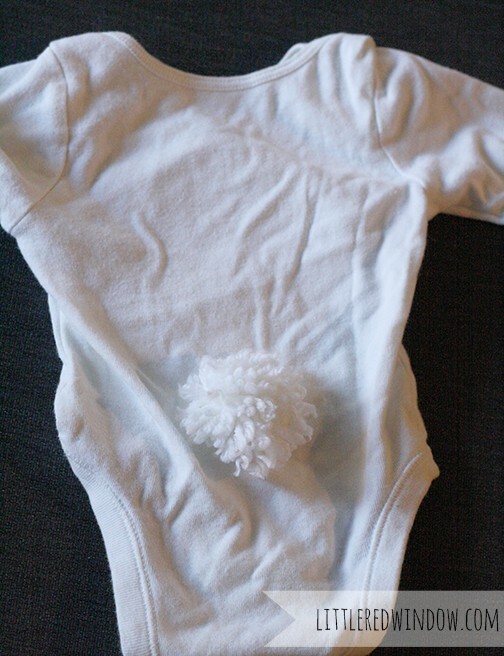 Then I made an easy white yarn pom pom and stitched it to the back. O was still in the stage where we held him a lot,if you had a little one who spent a lot of time lying down in a swing or bouncy chair or something, the tail obviously wouldn’t be comfortable for them. To make the little mittens, I just roughly traced the size of the hand out of felt, cut two of the same shape, sewed around three sides and turned them right side out. 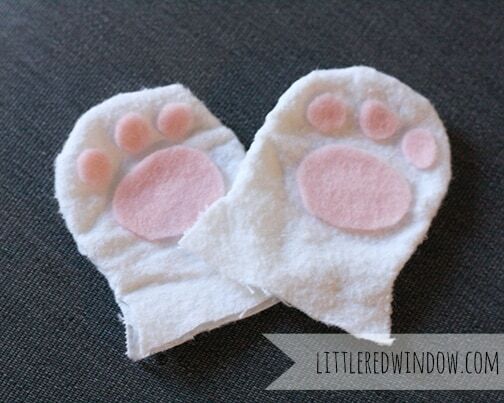 Then I added the little pink paw pads. They didn’t stay on that great and if I had had the time or the energy, I might have added some elastic. But you know what, for the three seconds that he was willing to keep them on, they looked cute enough! To make the bunny ears, I remember i really struggled trying to figure out what to make them out of. I thought cardboard at first but that wouldn’t really hold it’s shape. I didn’t have pipe cleaners. I didn’t want to use wire because I was afraid it would poke his little head. And then, deep in sewing supplies I found some leftover plastic boning! It was perfect, it held a curve but wasn’t tight and didn’t have sharp ends! I covered it in felt, I think I made the ears out of boning too? And then stretched felt across those as well. 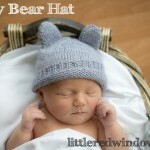 And again I used a little felt flap with velcro under the chin instead of elastic because I was a nervous new mom! Elastic might strangle him! (Actually it might, I probably would still not use it) The strap was enough to keep the ears on but it was not at all tight under his chin. Are you dying to see a Baby Bunny yet? Ok, don’t die of cuteness and then say I didn’t warn you! Look! 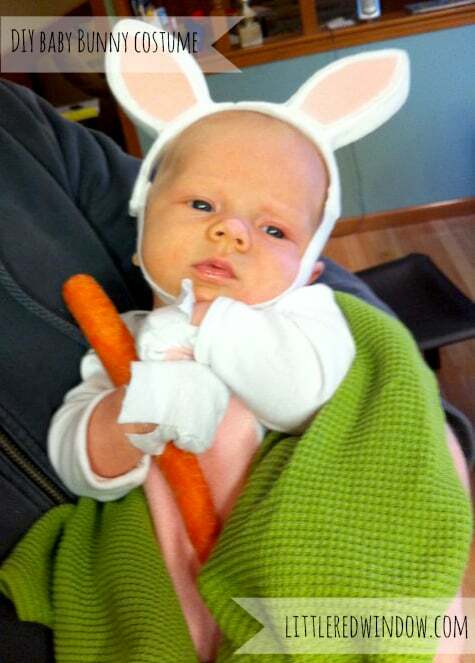 He has a little pink nose and a real carrot! !